To your great delight, you and the man you have been dating for some time have decided to move in together. After the discussion about who will move in with whom and laying out who will do certain chores around the home, you figure the worst debates are over. Filled with happiness, you pick up a box filled with elegant lace curtains and floral pillows into your new home. What meets you almost make you drop the box on the floor. The table in the living room is covered in fast-food bags, there is a giant poster of a woman, nearly naked, above the television and to top it all off, there is a life-sized replica of a stormtrooper in the bedroom. How will you ever be able to sleep with a stormtrooper staring you down every night? What you need is a way to harmonize the male and female elements in your home to create something enjoyable for both you and your man. There are two options when combining male and female styles. The first is to make everything gender neutral. Keep in mind this covers everything from the wall decor to the scent of hand soap in the bathroom. The second option is to have a little of both of you in the home. Compromise must happen here and if you expect to keep something particularly girl, be ready to accept something masculine as well. There are such things as neutral colors and neutral plants that you can use in your decorating. People often differ in opinion when it comes to colors that are associated with a gender and colors that are not. Yellows, greens and some shades of red look great together and usually aren’t associated with specific genders. Other colors, like black, brown and white, are also neutral both in color and in gender. When it comes to furniture, wall art and blankets, anything covered in lace, flowers or shoes will have to go. Likewise, anything with sports teams, scantily clad women or beer will not be in the home. 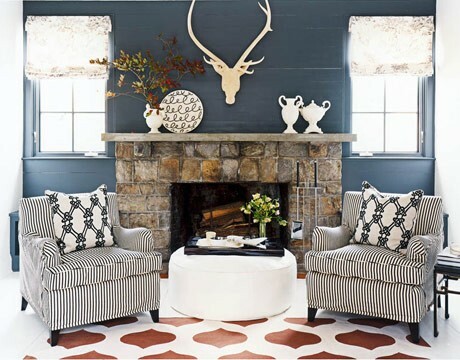 Keeping the neutral colors in mind, pick patterns that are big and abstract. You can easily find wall art and furniture that fit this theme. To those who are up to the challenge, compromise can create a wonderful mix of male and female elements. Start out by having you and your partner list five must haves and five must goes. You will choose the items you own that you insist on keeping and the items your partner has that you want to get rid of. He will do the for you. Now comes the discussion. If he wants to get rid of something on your list of must haves, he must be willing to part with one of his and vice versa. This discussion doesn’t have to be all give and take. A compromise may involve the storm trooper being placed in the living room so you can sleep at night so long as the frilly pillows and lace curtains stay in the bedroom. If you are insistent on getting rid of something of his, be ready to get rid of something you own. Often, when two people move in together there is an excess of items anyway. It shouldn’t be two ominous that some things will need to go. You are combining two sets of dishes, two sets of blankets, two sets of furniture. Don’t be afraid of getting rid of anything. Merging male and female styles in a home is like any serious relationship. To succeed, you both must be willing to compromise and sacrifice. If you are worried about the stuff you may get rid of, consider storing it at your parents house or a storage facility. There may be a time where you move into a bigger home where and want a man’s den and, just to be equal, a ladies den as well. Author Bio: Tonya Vrba is a passionate writer. Her work has been published in newspapers and blogs. She frequently writes about online dating, health, careers, books and college. Learn more about her work at her personal website. Great guest post! Lots of wonderful ideas! P/S: Come by and enter my current giveaway for a chance to win $100 credit towards a beautiful personalized canvas!